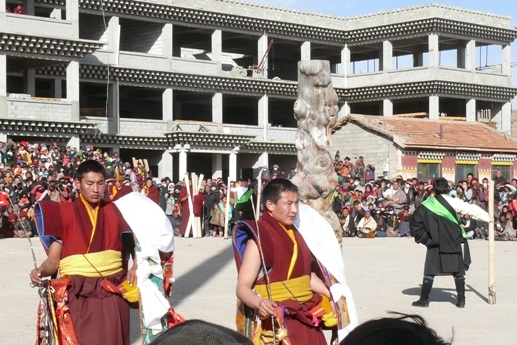 Why is it necessary for ordinary-looking long white wooden poles to be taken from Kirti Gompa by a group of large, intimidating and ferocious Dhob Dhob disciplinarians? Obviously they are preparing the area for some important activity, but so far the only item in view is an old tree trunk – very gnarly, very un-handsome, and still standing. It seems that the ugly stump, with its warts and bumps and blemishes, is the receptacle of evil things. Bad thoughts, evil emanations, bad karma are transferred to the tree throughout the year and await their expulsion. Today, they will be sent away by the long white wooden poles. The poles are given by the Dhob Dhobs to a specially selected group of local young men who have been training for this day for a long time. It is not easy to strike an old hard tree stump in a truly meaningful manner with a long pole without preparing your shoulder and your arm for such forces. As the first fellow prepares, the Dhob Dhobs ensure the crowd remains in place. Under the watchful eyes of his fellow ‘bashers’, tribute is paid to the stump - and the evil spirits are warned of their impending doom. The striker then faces the stump, adjusts his clothing, and prepares to ‘bash the spirits’. Since this is as much a competition of skill, strength and coordination amongst the group of bashers, it should be noted that only one arm is used in swinging the pole. The crowd holds its breath, awaiting the loud ‘crack’ that accompanies the pole striking the stump. 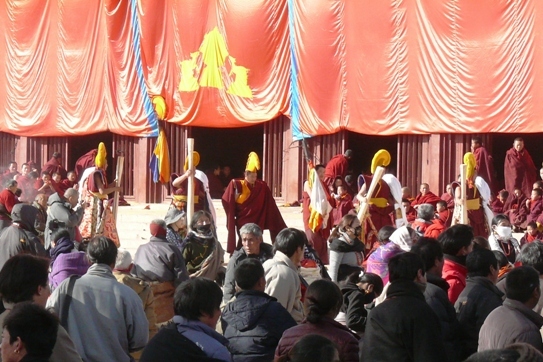 With good form, lots of strength, and some luck, the end of the pole will snap off, indicating a successful expulsion of some evil spirits. The spectators await the sight of a piece of wood flying through the air. They are not to be denied. The first strike has been successful (the end of the pole is lying on the ground) as the assailant winds up for the second strike. He was successful with the second strike, and set a high standard for the remainder of the group who watched with interest (and perhaps some trepidation). 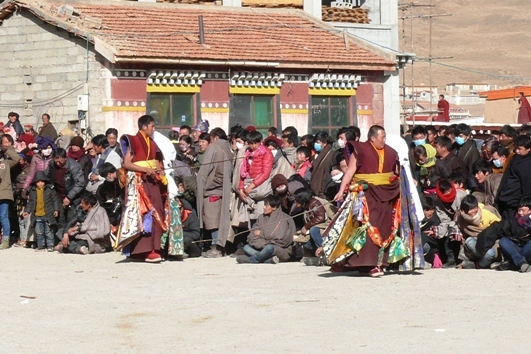 This ceremony was held during 2016 Losar celebrations at Kirti Gompa. There was no public announcement that it would happen, and nothing was found about it on the internet, either before or after. It seems to be very much a local event particular only to Kirti. I have never encountered or heard of anything similar during my years of travel in the region. But the activity was known amongst the local population, and they came and started selecting their places for best viewing one or two hours before the Dhob Dhobs arrived. The event was certainly competitive amongst the young men who assailed the tree stump with their poles. The ‘winner’ was the man who broke his pole twice, once during each of two swings. One poor fellow took six swings and was not successful in breaking off even a small piece of his pole – the pole simply started shredding itself lengthwise. He was disappointed. Of the three men who completed the task in two swings, the one whose pieces travelled the furthest was held in the highest esteem. This meant that the piece travelled some distance into the crowd of onlookers – but medical attention was not required! A second competition was held two days later. This time the poles were swung by the group of Dhob Dhobs. As one might well expect, all were able to easily break their poles into pieces in two swings. The secret probably lies in the jaunty tilt of the hat …. And the tree stump was well bashed, expunged of evil spirits, and ready for next year! !